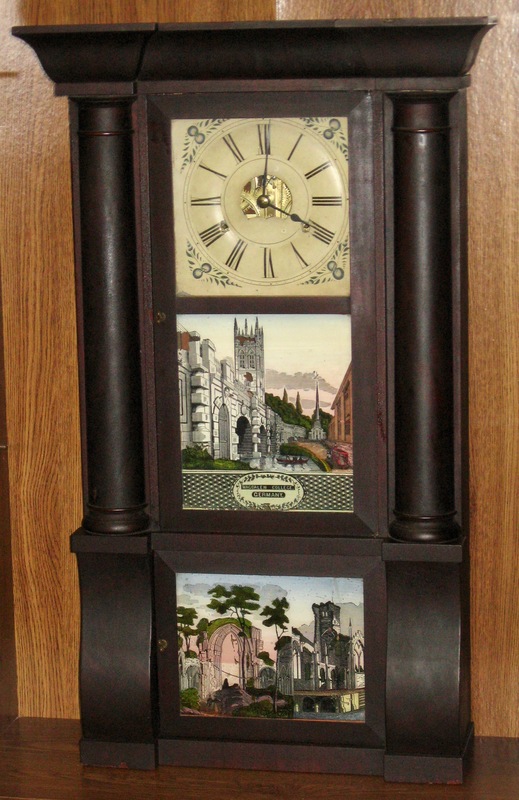 Birge, Peck & Co. 8 Day Clock with Magdalen College Glass, ca. 1849. A man brought this clock to my shop and said “If you don’t buy this clock, I am going to throw it away!” He had owned it for more than 20 years, and was tired of moving it from house to house. I bought it! I love old American weight driven clocks, and this one has outstanding glasses. The center glass says Magdalen College, Germany.” Magdalen College is actually in Oxford, England, and it even has the exact tower shown on the glass! The tower was completed in 1509. The lower glass shows trees, and ruins of arches and the tower. This is a “Standard 8-day Column and Cornice” clock. 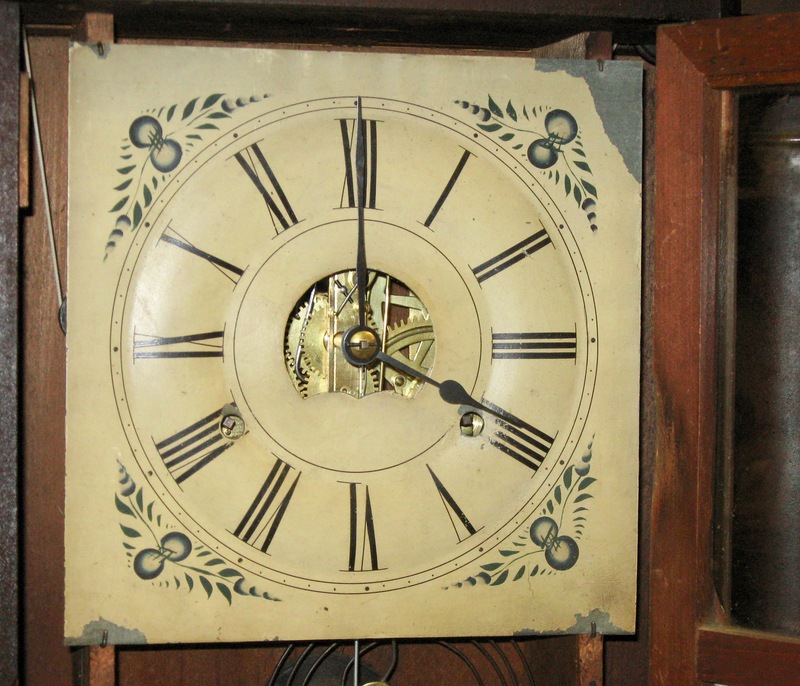 The painted metal dial is original, with minimal paint loss. I cleaned the finish on the case, repaired the movement, and bought two weights, as the originals are missing. The left (strike) weight is 6 pounds 11 ounces (I bought it from Merritt’s Antiques, part number CW-2). The right (time) weight is 7 pounds 9 ounces (I bought it on ebay.com). The hands are new replacements. The case is 32 3/4 inches tall, and 19 13/16 inches wide at the top. The outer circle of the dial is 7 3/16 inches diameter, the next circle is 6 7/8 inches diameter, and the inner circle is 3 11/32 inches diameter. 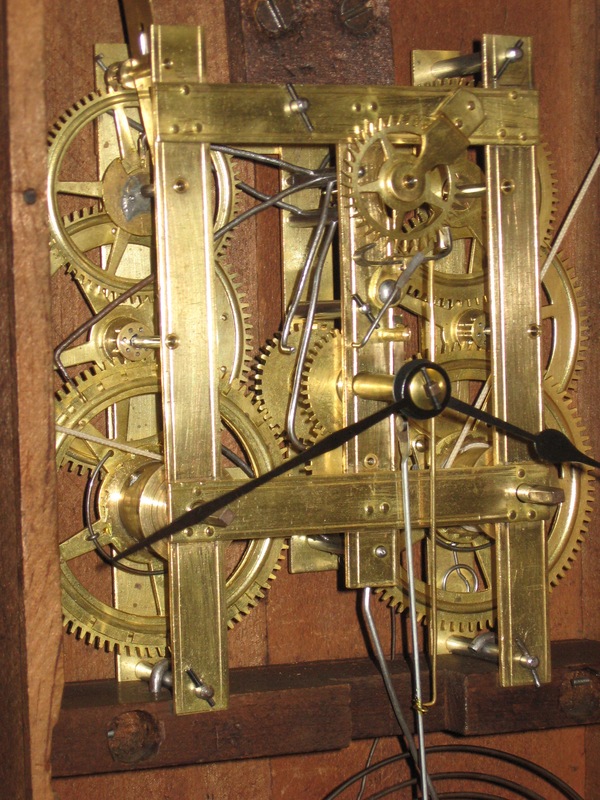 When I bought the clock, the movement was missing the verge, hammer and minute wheel. I bought an identical movement on eBay to get the missing parts from. I cleaned the movement, polished the pivots and installed bushings. The movement ran well with a 6 pound 11 ounce weight for the time (on the right), but the 7 pound 9 ounce weight increases the pendulum swing, and is closer to what it probably had originally.